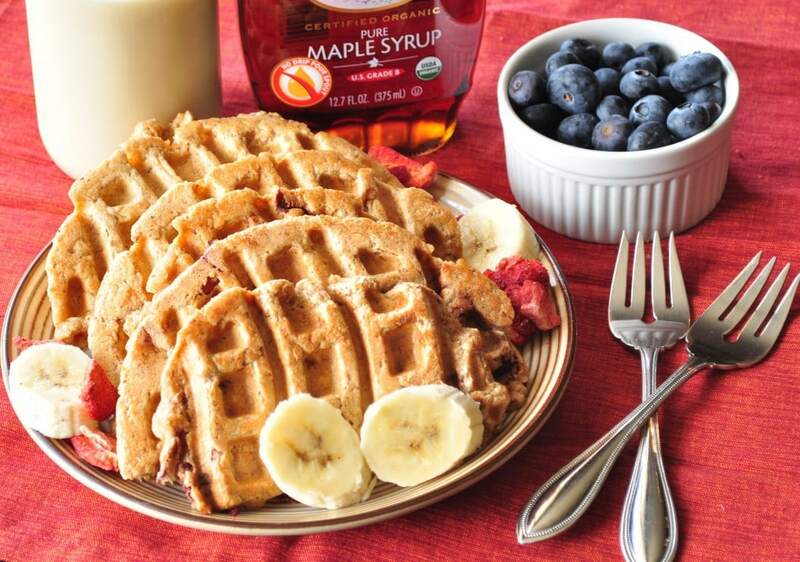 At our house, Sundays have a morning tradition of homemade waffles or pancakes. Last week we had Blueberry Oatmeal Waffles. This week, my daughter requested strawberry banana waffles. So that is what we had. I mix all the dry ingredients the night before so it takes only minutes to whip them up in the morning. I got five large waffles out of this batch. There were hardly any leftovers. I used freeze dried strawberries for this recipe, so if you use fresh, you may need to slice them thin and use a little bit less liquid. Do you have any weekend traditions? Then add the wet and mix only until combined. Be careful not to over mix. That’s all there is to it. I hope you all enjoy these as much as we did. Shady Maple Farms organic pure maple syrup. I got it at Natural Grocers. What can I use in place of spelt flour? You can use white whole wheat or all purpose. What kind of baking powder do you use Melissa? Bob's Red Mill aluminum free. Hi Melissa! I love all of your recipes! Do you know of a substitute for coconut flakes and nutritional yeast? Thanks Tracie! It would depend on the recipe. is fresh or freeze dried strawberries best for this recipe? I used fresh. Either should work. Hello Melissa! What waffle maker brand do you use or can you suggest one, please. Thank you. Thank you, Melissa, for the prompt reply. I just saw patterns on waffles and they look different. Is it the same waffle maker that you suggested? Thank you for your recipes and your help.